The old Romans already knew that it was up most important to keep the poorest part of the population happy. The roman writer Juvenalis (60-140 AD) already wrote panem et circenses. In his writings he used this phrase sarcastic, to show that the citizens were ignorant about the already declining status and importance of the roman empire in the world. As long as there were games and bread for free, the nation was “happy”. It seemed to him that the citizens were unable/unwilling to see the real problems. It seems that the current American citizens have more in common with the roman citizens then they would think themselves. This entry was posted in Social security, US on October 15, 2013 by Dirk. Is inflation actually a good thing? During my time at the University in Amsterdam, I’ve learned that inflation is key for a healthy economy. Negative examples of lack of inflation (or deflation) has always been Japan, a theme relevant again since the financial crisis, which lead to limited inflation in European countries. News agencies have stated that one of the key qualities of Bernanke, which lead to his appointment of Chairman of the FED, has been his in-dept research on alternative tools the central bank of Japan could have used to fight deflation (i.e. increase inflation). Other literature also indicates that inflation increases consumer spending as a dollar earned today will be worth less in the future, increasing direct consumption and decreasing savings. But why is inflation good? Who actually benefits from inflation? Is 5000% inflation in 100 years a good thing? Does the consumer benefit from inflation? I’ll try to briefly touch base on the above topic to inform you about inflation. I’ll let you decide if inflation is a good thing. In my view inflation leads to a decreased saving appetite, increased spending on consumption goods and decreased spending on capital goods (which are in general more expensive). Inflation leads to increased credit demand (mortgages / car loans) as a consumer loses purchase power on saving money for expensive capital goods like cars and houses. Inflation may lead to a short term spending horizon, which in addition leads to increasing spending on consumption goods. Inflation together with advertisements are in my view one of the main drivers on our consumer society, which is unsustainable in the long run as resources are limited. One might say that inflation is good for consumers as most people have high mortgages. 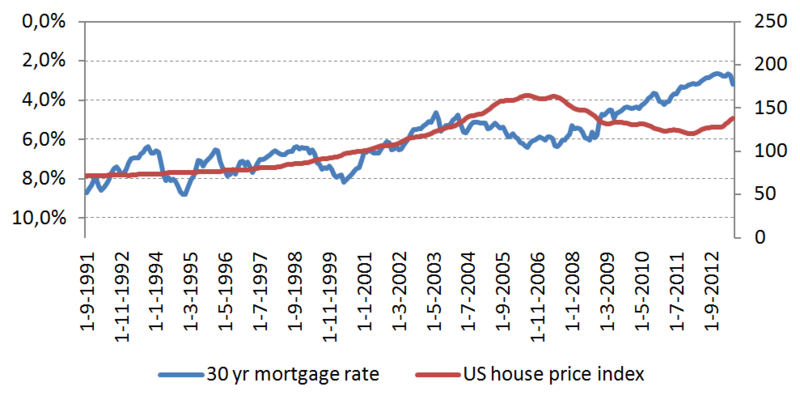 With high inflation the mortgage stays the same, but the housing prices increase with inflation in the long run > decreasing the loan to “home value” (LTV) ratio over time. One might forget that the consumer compensates the bank for inflation in its annual interest paid (I’ll explain this later). This only works in a society in which consumers have high debt. A situation with zero inflation would considerably decrease mortgage expenses and decrease debt as financials headroom is used for loan repayment instead of inflation compensation. When we look at the past 100 years we see an average inflation per annum of 3.5%. Looking at today’s US treasury Yield Curve the 1 month yield is close to the 0% FED rate and the 30 year yield is close to the long term average inflation rate of 3,5%. 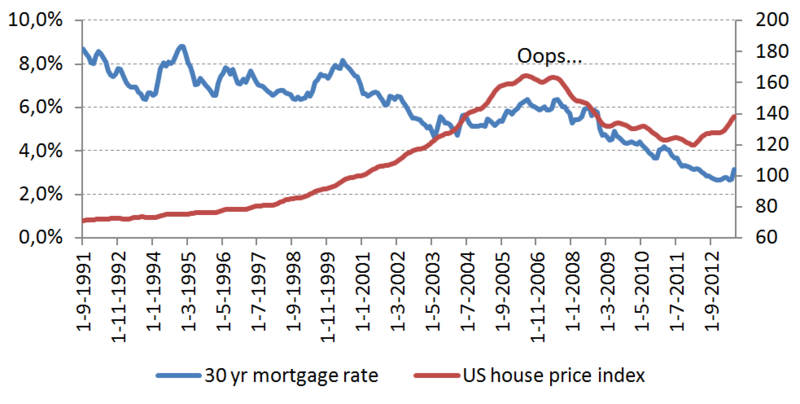 One can state that the current US Treasury only compensates treasury holders for the long term average inflation, e.g. zero non repayment risk is actually priced in. How does inflation influence interest rates? In the recent period (and current situation) the long term interest rate has been higher compared to the short term interest rate. This is driven by among others higher expected inflation in the future. This is the reason why interest rates between 10 year and 30 year (close to long term inflation average) differs less compared to current 3 months & 10 year interest rate. Is inflation the main driver for market’s need for interest swap derivatives? One of the most used derivative is the interest rate swap, which swaps flexible interest rates for a fixed interest rate (3 months Euribor + x% = 5 year fixed rate) and vice verse. In my view without inflation, we can expect relative flat interest rates, which makes interest derivatives mostly obsolete. Inflation happens when money/credit supply exceeds adjusted demand for goods/loan redemption. Simply stated; if the world has (1) 100 inhabitants and (2) there are 100 dollar in circulation in the economy and there is (3) one apple tree which provides 100 apples each year and (4) all an inhabitant needs is 1 apple a year and (5) all inhabitants work at the tree company and earn 1 dollar a year. The price of an apple is 1 dollar. When a bank is incorporated and provides 50 dollar credit to the inhabitants (without any interest) the second year (one might want more then one apple), there are now 150 dollars available in the economy. With a stable supply of 100 apples, the price for an apple will slowly increase to 1,5 dollar. In an ideal world with 0 short term and long term inflation, a person borrowing money would pay for non repayment risk as well as opportunity cost to the person/bank he borrows money from. The risk on non-repayment decreases when the person buys a home from the loan as this will increase the collateral. When the market value of the collateral is close to the loan amount, non-repayment is limited when the Lender has a pledge on the collateral. (selling the home will result in repayment of the loan). A result of a pledge on the above collateral will result in a lower interest the person has to pay to the Lender (close to the opportunity cost). Option 1 with zero inflation: Now lets say the above person has to pay 2% interest rate for a 30 year loan to the above Lender. In addition the person repays the total loan in 30 years (3,33% per year). After 30 years he has fully repaid the loan and he owns the house. Option 2 with inflation: Now lets say there is a 3,5% long term inflation. The lender wishes to be compensated for the 3,5% inflation in addition to the 2,0% interest rate. The Lender now has to pay 5,5% interest rate per annum and had no money left for loan repayment. After 30 years of interest payment. The person still had both a home and full loan amount. In purchase power however the loan decreased with 3,5% over 30 years = 65% or in other words. If the house would have cost the Lender 100 dollar, the house would now be worth 100 x 3,5% price increase per annum = 280 dollar. In a next topic I’ll continue on the question who actually benefits from inflation. This entry was posted in Inflation, US on September 25, 2013 by Dirk. Germany has a strong economy thanks to Gerhard Schröder and not thanks to Angela Merkel. Minimum wage is “tricky”, it is difficult to find the right optimum. ECB members need to be less bounded by home country politics. The last statement seems very interesting as he puts forward the idea of regional central banks for Europe. Where Europe could be split-up in 5 regions (one for example Netherlands, Northern Germany, Denmark and Belgium), each with there own central bank. With this split-up he tries to minimize local political influence of ECB directors. He gives as example the marvelous FED in the US. We know that the FED in the US has more influence on Wallstreet than the president himself. The chairmen of the FED is not Democratically chosen. A key question he does not answer or even put forward is “what is the benefit of a central bank”. And “what should be the task-set of the ECB / a central bank”. This year the FED celebrates the 100 year anniversary. The dollar, in the hand of the FED has lost 98% (5000% inflation) of its value in the past 100 years (4% inflation per annum). Compared to a 0,5% average inflation per annum (64% inflation) in the 100 years before the FED. Key question is, “who benefited from the huge depreciation of the dollar during the past 100 years“? Without giving the answer to the questions above. I find it hard to take solutions from the the current order serious. Dear readers, try to find answers to the below questions yourself, then look at economic policies of the last 100 years and decide for yourself. What would be wrong with 0% average inflation in the long run (e.g. when you can buy an apple with 50 cents and you decide not to buy the apple but save the 50 cents at t=0, that you can still buy the apple at t=40 for the same 50 cents)? Zero interest rate on your savings with 0% risk of losing your money combined with 0% long term inflation. Relative stable interest rates with banks. Limited requirements for interest rate swaps due to flat interest rate curves. I’m looking forward to your answers and ideas! This entry was posted in ECB and tagged central banks, ECB, Michael Burda on September 21, 2013 by Dirk. Recovery Dutch housing market expected…..
On Friday 13-9-2013 Rabobank (the Dutch bank with the largest exposure in mortgages in the Netherlands) indicated that the Dutch housing market was 10% undervalued. This was partially supported by the CPB who is expecting a recovery in 2014. One may wonder how the Rabobank and the CPB “calculated” this forecast number as the same CPB expects that the average purchasing power will decline next year with 0,5% and expects that unemployment will increase from 8.7% to 9.25% (7.5% according to international definition?!). Including credit tightening with Dutch banks and lack of international appetite for Dutch mortgage funding, I guess expected interest rate will be the main driver for Rabobank its forecast model. 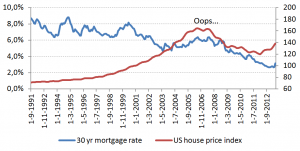 I wonder if the Dutch government is desperately hoping for a wealth effect, as Zerohedge previously wrote about in relation to the US housing market, for the Netherlands. Going one step further, on September 17th the Dutch prime minister will present the governmental budget plans for the year 2014. This includes a forecast on budget shortage of 3.3% of GDP for the year 2014. 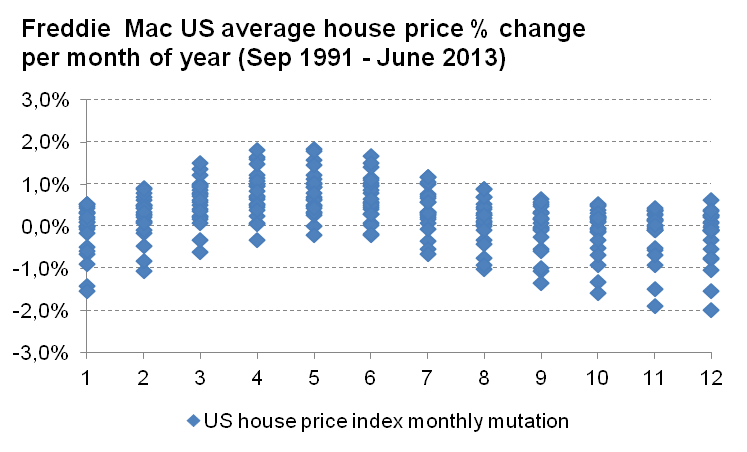 As mentioned earlier the CPB included an expected price increase of the Dutch housing market for the year 2014 in its forecast model. 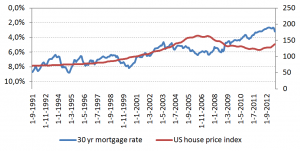 If this model also includes an expected decreased in mortgage interest rates and a subsequent wealth effect. I fear the real austerity is yet to start… We will see what 2014 will bring to us. This entry was posted in Netherlands on September 15, 2013 by Dirk. After strong numbers for July my guess is that August will bring some positive news as well. 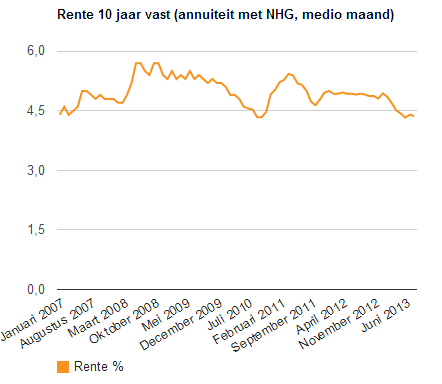 Dutch media report that the bottom of the housing market might be in sight (as they did in 2009/2010/2011 and 2012). I guess we will see what will happen. I was wondering which months are historically the strongest (for the last 18 years) and which were the weakest months? It turns out that the first 8 months of the year are strong and the last 4 months are relative weak. 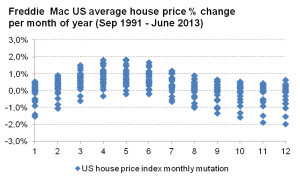 The two outliers in January and July are caused by a system change in the Netherlands related to tax deductability of the interest paid. This entry was posted in Netherlands and tagged Housing market, Netherlands on September 6, 2013 by Dirk. Looking into the data provided by Freddy Mac I would not have thought the data would have been so nicely distributed. One can only benefit from this overview as it seems that nearly everybody is happy during spring time.